After 5 years of being in the Top Ten in AUGI's Top DAUG contest after the written portion I have finally made it to the top position, after being runner-up last year (2005) in Orlando during AU. 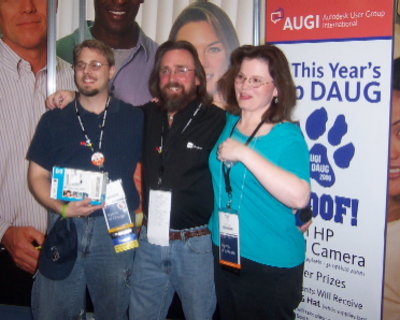 I placed in the top spot during the CAD Camp in Minneapolis in 2005. Congrats to Craig Black for coming in second place (for the second time) and also KaDe King for landing in third place after making it into the top ten two other times, but not knowing she did. 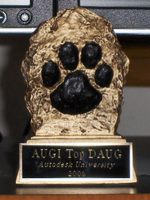 Also congrats to everyone else that participated in the top ten and the AUGI Top DAUG contest. Now that I have won it, I am no longer eligible to participate, as AUGI doesn't allow past winners to participate again in future Top DAUG contests... some might feel this rule is unfair but it is the right thing to do in my opinion and has been a rule since the first contest 5 years ago. So good luck to both Craig Black and KaDe King, hope you both win the AUGI Top DAUG contest in the future as you both deserve it. Both Craig and KaDe have placed in the Top Ten multiple times each at past AU's, Craig has placed second twice now. Update: My luggage has been found on Saturday sometime, but never received a phone call from the airlines that it was ready for pick up.